An unusual new comet has been discovered. Or perhaps it should be called an asteroid. Whatever it is, it has six tails and is called P/2013 P5. It was first observed the end of August this year, but now a new paper in Astrophysical Journal Letters gives the initial results of observations so far. P/2013 P5 is referred to as a comet because it has a tail. Six of them in this case, as you can see in the image below (taken from the paper). But comet tails usually form when volatiles (ice and organics) evaporates off the comet’s surface when heated by sunlight. This is why there is so much attention given to comet ISON as it nears the Sun, for example. But P/2013 P5 isn’t likely to have much volatiles. 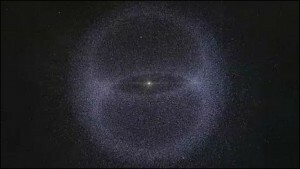 It’s orbit is part of the inner asteroid belt, and is likely part of the Flora family. That means it probably came from the asteroid 8-Flora, and was knocked off a couple hundred million years ago when an asteroid collided with 8-Flora. We’ve found meteorites from the Flora family that are metamorphic rock, meaning Flora formed at temperatures too high for volatiles. So that really makes it more like an asteroid than a comet. Another way P/2013 P5 is more asteroid than comet is that its Tisserand parameter is unusually high for a comet. The Tisserand parameter is a number that remains roughly constant for solar system objects, and is a measure of an object’s speed relative to a planet. Usually the planet in question is Jupiter, (the Tj parameter) since it is the largest planet and has a significant gravitational influence on the orbits of asteroids and comets. Most short period comets have a Tj between 2 and 3, while most asteroids have a Tj greater than 3. There are exceptions, but Tj = 3 is a commonly used dividing line between asteroids and comets. For P/2013 P5, Tj = 3.66. So if P/2013 P5 is more rocky than icy, and its orbit is more asteroid-like than comet-like, why does it have a tail, much less six of them? As the authors of the paper point out, the tails are ejections of dust from various points on the object. They began ejecting at different distinct times, and then solar radiation pressure caused the dust to stream out like a comet tail. Since the ejection of dust has been steady, it isn’t likely to have been caused by a collision with another asteroid. As you can see in the image below, the different tails changed significantly relative to each other in a span of less than two weeks. This implies that P/2013 P5 has a relatively high rotation rate. So the authors propose that the dusty tails are due to this rotation. If the surface P/2013 P5 had lighter and dark regions, the difference in sunlight pressure on different regions could have exerted a torque on the object, causing it to gain rotational speed. As P/2013 P5 was spun up, dust on its surface would tend to slide toward its equator. Eventually some of the dust would break free and stream away (similar to the way you feel like you’re being pulled outward when you round a corner in a car). 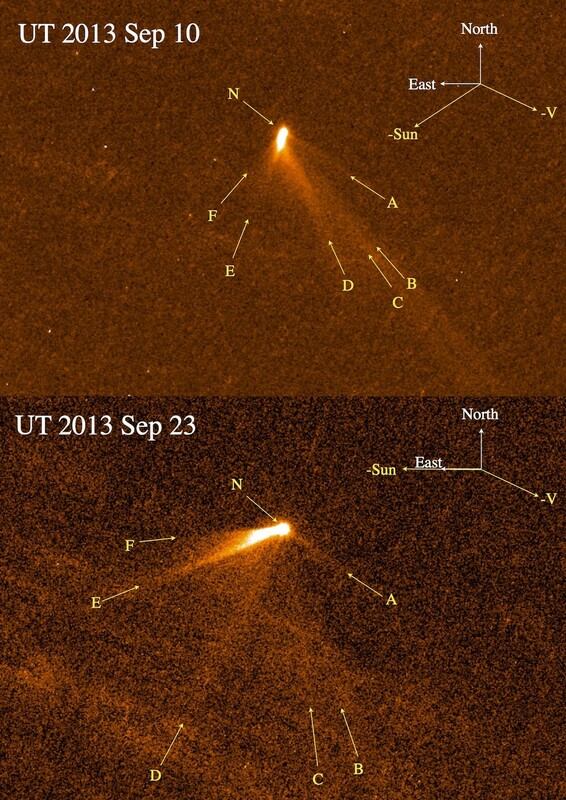 If it is correct, then the dust tails should be streaming from the equatorial region of P/2013 P5. It will take further observations to determine the rotational axis of P/2013 P5 and put this idea to the test.